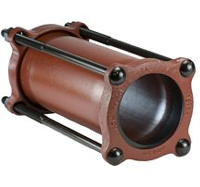 JCM 202 Steel Couplings provide an easy means of joining plain end pipe. These couplings are especially applicable for use on steel, galvanized, PVC and other pipe with standard steel dimensions 2" - 12". Call for availability for cast iron and other pipe in sizes 14" and larger. Provides longer length for longer space between pipe ends. Especially good for repairing PVC pipe. No beveling, costly threading, exact pipe alignment or fitting is required. Note: Applications in which pipe may move out of the coupling, correct anchorage of the pipe must be provided.